🙋‍♂️ Need help in buying HPE 726897-B21 Smart Array P840/4GB FBWC 12Gb 2-ports Int SAS Controller? Please contact us now. 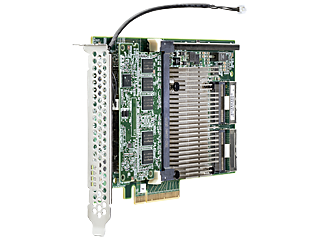 The HPE Smart Array P840 Controller is a full height, PCIe3 x8, 12 Gb/s SAS RAID controller that provides enterprise-class storage performance, increased internal scalability, and data protection for HPE ProLiant Gen9 rack and tower servers. It features 16 internal physical links and delivers increased server uptime by providing advanced storage functionality, including online RAID level migration between any RAID levels with FBWC, global online spare, and pre-failure warning. This controller supports 16 drives without need for the SAS Expander Card providing point to point connectivity to SSDs for lower latency. This controller has transportable FBWC allowing the data in the cache to be migrated to a new controller. The Gen9 controllers support the HPE Smart Storage Battery that allows multiple Smart Array controllers to be supported, resulting in simple upgrade process.